The Beretta M9, officially the Pistol, Semiautomatic, 9mm, M9, is a 9×19mm Parabellum pistol adopted by the United States Armed Forces in 1985. 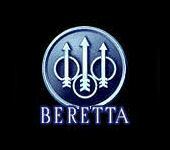 It is essentially a military specification Beretta 92FS. The M9 won a competition in the 1980s to replace the M1911A1 as the primary sidearm of the U.S. military, beating many other contenders, and only narrowly defeating the SIG P226 for cost reasons. It officially entered service in 1990. Some other models have been adopted to a lesser extent, namely the M11 pistol, and other models remain in use in certain niches. The M9 was scheduled to be replaced under a United States Army program, the Future Handgun System (FHS), which was merged with the SOF Combat Pistol program to create the Joint Combat Pistol (JCP). The JCP was renamed Combat Pistol (CP), and the number of pistols to be bought was drastically cut back. The U.S. Army and Air Force are seeking to replace their M9s through the Modular Handgun System program.